I just returned from the four-day Money 20/20 event in Las Vegas. The show covers the overlap of Money and Technology including FinTech, Payment, Ecommerce and more. It had tens of thousands of attendees, over 3,500 companies, and 400 startups and lots of starpower including Richard Branson, Shaquille O’Neil, Akon, and yours truly speaking on a biometrics panel. On the same day that Apple rolled out the iPhone X on the coolest stage of the coolest corporate campus in the world, Sensory gave a demo of an interactive talking and listening avatar that uses a biometric ID to know who’s talking to it. In Trump metrics, the event I attended had a few more attendees than Apple. Interestingly, Sensory’s face ID worked flawlessly, and Apple’s failed. Sensory used a traditional camera using convolutional neural networks with deep learning anti-spoofing models. Apple used a 3D camera. It’s always nice when Sensory wins an award. 2016 has been a special year for Sensory because we won more awards than any other year in our 23 year history!! 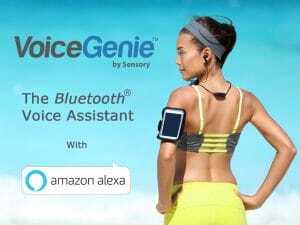 Sensory Inc., a Silicon Valley company that pioneered the hands-free voice wakeup word approach, today, announced it has won over half a dozen awards in 2016 across its product-line, including awards for products, technologies, and people, covering deep learning, biometric authentication and voice recognition. AIconics are the world’s only independently judged awards celebrating the drive, innovation and hard work in the international artificial intelligence community. Sensory was initially a finalist along with six other companies in the category of Best Innovation in Deep Learning, and judges determined Sensory to be the overall WINNER at an awards ceremony held in September 2016. The judging panel was comprised of 12 independent professionals spanning leaders in artificial intelligence R&D, academia, investments, journalists and analysts. CTIA Super Mobility 2016™, the largest wireless event in America, announced more than 70 finalists for its 10th annual CTIA Emerging Technology (E-Tech) Awards. Sensory was nominated in the category of Mobile Security and Privacy for its TrulySecure™ technology, along with Nokia, Samsung, SAP, and others. Sensory was presented with the First Place award for the category in a ceremony on September 2016 at the CTIA Las Vegas event. 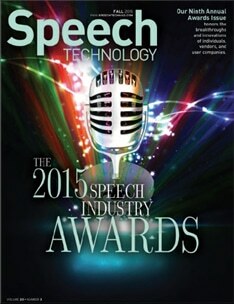 Speech Technology magazine, the leading provider of speech technology news and analysis, had its 10th annual Speech Industry Awards to recognize the creativity and notable achievements of key influencers (Luminaries), major innovators (Star Performers), and impressive deployments (Implementation Awards). The editors of Speech Technology magazine selected 2016 award winners based on their industry contributions during the past 12 months. Sensory’s CEO, Todd Mozer, was awarded with a Luminary Award, making it his second time winning the prestigious award. Sensory as a company was awarded the Star Performer award along with IBM, Amazon and others. Two well-known industry analyst firms issued reports highlighting Sensory’s industry contributions for its TrulyHandsfree product and customer leadership, offering awards for innovations, customer deployment, and strategic leadership. 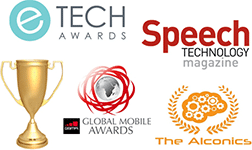 We are pleased to announce that Sensory’s TrulySecure technology has earned first place in this year’s CTIA E-Tech Awards. We believe that this recognition serves as a testament to Sensory’s devotion to developing the best embedded speech recognition and biometric security technologies available. For those of you unfamiliar with TrulySecure – TrulySecure is the result of more than 20 years of Sensory’s industry leading and award-winning experience in the biometric space. The TrulySecure SDK allows application developers concerned about both security and convenience to quickly and easily deploy a multimodal voice and vision authentication solution for mobile phones, tablets, and PCs. TrulySecure is highly secure, environment robust, and user friendly – offering better protection and greater convenience than passwords, PINs, fingerprint readers and other biometric scanners. TrulySecure offers the industry’s best accuracy at recognizing the right user, while keeping unauthorized users out. Sensory’s advanced deep learning neural networks are fine tuned to provide verified users with instant access to protected apps and services, without the all too common false rejections of the right user associated with other biometric authentication methods. TrulySecure features a quick and easy enrollment process – capturing voice and face simultaneously in a few seconds. Authentication is on-device and almost instantaneous. TrulySecure provides maximum security against unauthorized attempts by mobile identity thieves from breaking into a protected mobile device, while ensuring the most accurate verification rates for the actual user. Compared to published data by Apple, the iPhone’s thumbprint reader offers about in 1:50K chance of a false accept of the wrong user, and the probability of the wrong user getting into the device gets higher when the user enrolls more than one finger. With TrulySecure, face and voice biometrics individually offer a baseline 1:50k false accept rate, but can each be made more secure depending on the security needs of the developer. When both face and voice biometrics are required for user authentication, TrulySecure is virtually impenetrable by anybody but the actual user. As a baseline, TrulySecure’s face+voice authentication offers a baseline of 1:100k False Accept Rate, but can be dialed in to offer as much as a 1:1Million False Accept Rate depending on security needs. TrulySecure is robust to environmental challenges such as low light or high noise – it works in real-life situations that render lesser offerings useless. The proprietary speaker verification, face recognition, and biometric fusion algorithms leverage Sensory’s deep strength in speech processing, computer vision, and machine learning to continually make the user experience faster, more accurate, and more secure. The more the user uses TrulySecure, the more secure it gets. TrulySecure offers ease-of-mind specifications: no special hardware is required – the solution uses standard microphones and cameras universally installed on today’s phones, tablets and PCs. All processing and encryption is done on-device, so personal data remains secure – no personally identifiable data is sent to the cloud. TrulySecure was also the first biometric fusion technology to be FIDO UAF Certified. While we are truly honored to be the recipient of this prestigious award, we won’t rest on our laurels. Our engineers are already working on the next generation of TrulySecure, further improving accuracy and security, as well as refining the already excellent user experience. 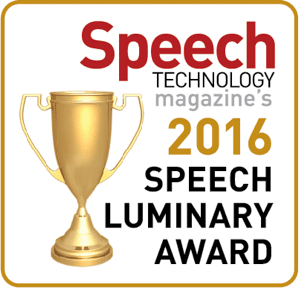 Sensory is proud to announce that it has been awarded with two 2016 Speech Tech Magazine Awards. With some stiff competition in the speech industry, Sensory continues to excel in offering the industry’s most advanced embedded speech recognition and speech-based security solutions for today’s voice-enabled consumer electronics movement. The editors of Inc. identified Sensory as one of America’s fastest growing companies. The annual ranking of the 5,000 fastest-growing private companies in the United States put Sensory at 3,301 on the list with over 100% growth over three years and 30 new jobs added. Sensory has a breadth of software products on the market contributing to its growth including TrulyHandsfree, TrulySecure and TrulyNatural, and can be found in over a billion consumer electronics devices around the world. Congratulations to the Sensory team for making the Inc 5000 list this year! 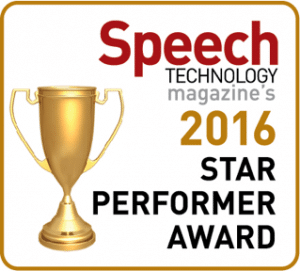 For the second year in a row, Sensory earns Speech Technology Magazine’s Industry Star Performer Award! 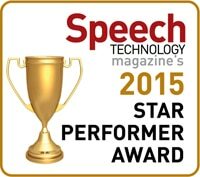 Having won the award in 2014 for TrulySecure Speaker Verification and for TrulyHandsfree 3.0, Speech Technology Magazine awarded Sensory the 2015 Speech Industry Star Performer Award for its recently released TrulyNatural technology. TrulyNatural is a major leap forward for client-based speech recognition and is the first embedded large-vocabulary deep neural nets speech recognition platform capable of supporting natural language. TrulyNatural is a scalable solution that can be implemented on highly constricted devices, supporting hundreds of phrases, with a footprint of under a megabyte, or as a natural language engine on devices with more available memory, like mobile devices, cars, and more. For more information about TrulyNatural, please visit the technology page.